Five years ago, a little known Jake Bugg tentatively stepped onto Cambridge Folk Festival’s smallest stage. We caught up with Bugg ahead of his headline billing at this year’s event to talk album four, Nashville, and whether guitars have personalities. Every successful musician starts somewhere - and they can look back at some defi ning moments during their rise to success. 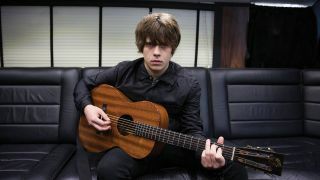 For Jake Bugg, two of those defining moments occurred at festivals - Glastonbury and The Cambridge Folk Festival. At Glastonbury, he graduated from the BBC Introducing stage to the main Pyramid stage in just two years. Jake’s rise at Cambridge was a little less immediate, but no less impressive for that - moving from the smallest venue on site, the Den, in 2012, to the main headline act this year. In the afternoon sunshine prior to his headline set, Bugg sat down for an extensive conversation about the spirit of guitars, recording in Nashville, and running new songs past trusted friends to get their approval before they make it to the record. We started by looking back to his appearance at Cambridge five years ago, which history shows to have been a pivotal experience. Not surprisingly, it didn’t feel like that to Bugg at the time. “I can’t say that it did, because obviously at the time I had no idea what was in store for me, or where things would go from there,” he explains. “It did feel very important, and very enjoyable as well. When I was growing up, I used to read about all my acoustic heroes playing this festival, so when I got a chance to play here it was just incredible. The audience were really attentive and I felt very connected, which is a big part of the joy of acoustic music for me. Bugg’s latest album, Hearts That Strain, is, he feels, something of a return to the traditional album format, with a sense of cohesion that was perhaps absent from its predecessor. “I think the new album Hearts That Strain does feel more like a proper album, I made it in Nashville with some amazing session musicians from there, and it does have a constant atmosphere in the production of the songs, more perhaps than I think I had with the On My One record. “I felt very comfortable in the traditional atmosphere of a Nashville recording studio, and I certainly learned a lot. They are the Memphis Boys, the drummer played on Dusty Springfield’s Son Of A Preacher Man, the band worked with Elvis Presley, so working with musicians like this is something I have dreamed about growing up, working in that environment with those players. "I didn’t feel intimidated playing in Nashville with seasoned session guys, because I have that feeling of being a little intimidated whenever I play with other people in any situation. Despite working with a full band, Bugg is acoustic for tonight’s headline slot at the Cambridge Folk Festival - with just a keyboard player to add some subtle colours. Does he feel at all exposed, without the comfort of comrades around him? “It can feel a bit exposed sometimes,” Bugg agrees. “But the upside of it is the freedom to change things around a little, and maybe do things slightly differently if the mood takes me, which you can’t do with a band, because it will throw everyone off and mess things up. With one other backing musician, he can follow me if I take a slightly different path on a song. There is an intimacy of connection when you are playing on your own, which I do like. The differences between solo and full band shows are not, it seems, limited simply to the number of bodies up there on the stage. It appears that consideration to the inclusion and exclusion of certain songs is also to be considered, as Bugg explains. Listeners to Bugg’s new album will hear a vintage, and also a distinctly dark feel in songs like In The Event Of My Demise. Is there a darker side to Jake Bugg the songwriter? “I do really like dark blues songs,” he replies with a careful smile. Every songwriter needs quality control; a sounding board, a person who can be trusted to listen to a new song and give an honest account about its quality and, crucially, whether it’s good enough for the record it is planned for. Bugg has quality control in his friends from back home in Nottingham where he grew up. “I have close friends that are really into their music, and I will try my songs out for them, and get their opinions. I also have friends who are Top 40 fans, and if I play them a song with a beat and they like it, then I know I have got the right pop vibe going on in there. “I do write all the time, it’s my hobby; I am just very lucky because I am able to do it as a job as well. I sit at home with my guitar, and I just write and write - sometimes I write songs that I don’t think are necessarily for me to sing, but I just enjoy trying things in different styles. “I don’t write songs with specific singers or artists in mind, but sometimes I write a song that I think is poppy, and I think it would sound better if a more pop-orientated singer than me did it, but that’s not something I set out to do, it’s just what happens when I write, what comes along comes along. “For this new album, I set myself a target of writing two songs a week, and I found that one song would come in about three hours, and the other would take the rest of the week to finish. Does he have a favourite song from this album? “I think my favourite is Southern Rain. I didn’t realise until I came to record it, when it was pointed out to me, that the session musicians may struggle with it, because it is written in two keys. I wasn’t aware of that at the time I wrote it, I just thought it flowed nicely. “That’s the difference between being self-taught like I am, and being a trained musician like the studio guys are. So they are asking me which key the song is in, and I can’t tell them because I have absolutely no idea! “I'm not a fan of formulas in songwriting, and being told that this is right and that’s wrong. It’s not the way I like to work as a songwriter and as a musician. I know there are the Top 20 pop songwriters who have these set formulas that they use that will resonate in peoples’ minds when they hear a song and it makes them listen to it and connect with it, it’s all scientific. Time to look back to Bugg’s first guitar - and a couple of the instruments that make up his current collection of more than twenty guitars. “My uncle brought a guitar for me when I was about 12. It was not an expensive one, maybe about £30, and I think he thought it would sit around his house gathering dust. So I started to play it and I learned the G and E minor chords, and it never felt like a chore to play it, I just enjoyed playing it when I had time. “Next I got a Yamaha FG-150 MS, and that was a great guitar. I think it cost around £170, and for that price, they are probably the best guitars around. I was just obsessed with guitars by then, I would save any money I got for Christmas and birthdays, and just buy guitars. When I got my record deal, I went straight down to the shop and got my first Martin, which was a guitar I always wanted, and I was really happy to have one. “When I was in Memphis I went to the Gibson factory and tried a Gibson ES-390 semi-acoustic which is wonderful. It was the showroom model I tried out, and the shop manager told me I could have it, so when I see all the photographs in their brochures, that’s the actual model that I’ve got. There is usually a nice little story to go with each guitar I have. “I also love my custom-made acoustics - I have had a couple made by Patrick Eggle who is a wonderful luthier. They are small body parlour-sized models with slotted headstocks and 12 frets, and I play one of those all the time, I love it. “I have always liked the smaller-bodied guitars, I just feel they have a better tone, maybe because the fretboard is nearer to the soundhole; there may well be people who will argue with me, but it does come down to personal preference, and that style of guitar is the one I enjoy playing the most. “Most of the tracks on the album were recorded using a Martin 000-18, a beautiful vintage model that I picked up while I was in Nashville. It’s got a small body, and the sound is amazing. “It’s still in the USA, though, because parts of it are made from Brazilian rosewood, and you need a licence to transport the wood across borders because its use is very strictly controlled; I'm trying to get the paperwork to bring it into the UK. The regulations are pretty complex and strict, so I really hope I can get it over. “I do miss that guitar, I loved playing it. It was an instrument I couldn’t put down. I would just see it in the corner and want to play it all the time. I do really like the way vintage guitars play and sound. “I also bought a 1963 Gibson Country Western model which I didn’t use on the record, but that’s another beautiful guitar. I arrived in Nashville without any guitars with me, which was a great excuse to just go shopping! I always go to Gruhn's Guitars when I get to Nashville, I have shopped there before and I know they always have a fabulous stock of acoustics there, so that’s a place I always call on when I am in the city. “Shopping for guitars is interesting, because you always go for a guitar that you like the look of first. It’s the visual attraction that gets you interested, but you really have to be aware that the guitars that don’t look that attractive to you can sound really amazing, so you have to get past the initial looks of an instrument and try it, because the sound is what you are really looking for. “There is a theory that guitars absorb something of the people who play them, so the older a guitar is, the more spirit it is going to have. It’s based on a good principle, when people play a guitar it resonates, and it resonates in the way it is played, so it does absorb something of the players who have worked with it. Jake Bugg's new album Hearts That Strain is out now.